Schedule periodic reports for your clients. In the Mimer Metrics reporting tool, you can choose one of our premade reports and customize them or easily build your own report from scratch. You can even include a text box with some extra information about the metrics you present. Schedule the periods, add report recipients and off they go – without you having to make each client’s report every week or month. Do you choose the Proffesional and Agency plans? Then you can add your own logo to the reports. Your clients will love be kept up-to-date with a report made just for them. When your clients receive a report it will load right in the web browser. That way the reports keep the nice interactivity. You can see each data point by hovering over the widgets. This will save you from a lot of follow-up questions. Sometimes you’ll want to add comments, explanations or extra information to your data. Especially if you’re sending a report to a new client, that needs some extra attention to understand how you work. 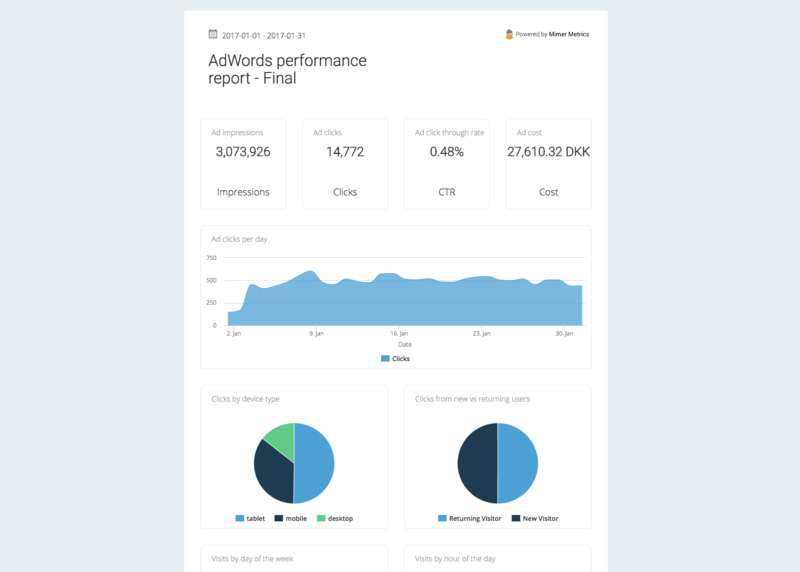 With our text widget, you can add headlines, text and links to your report. It’s a great feature if you want to make your reports even more useful by adding your thoughts, conclusions or advice to them.